Liverpool boss Brendan Rodgers has once again been singing the praises of his star striker, Luis Suarez, this time describing him as Liverpool’s equivalent of Barcelona’s Lionel Messi. This came after Suarez’s performance and skilful goal against Newcastle United at Anfield. The game ended in a 1-1 draw. “He plays the false nine role like Messi does for Barcelona, where he moves freely and others have to get in behind him to penetrate.” “Suarez’s goal was brilliant. 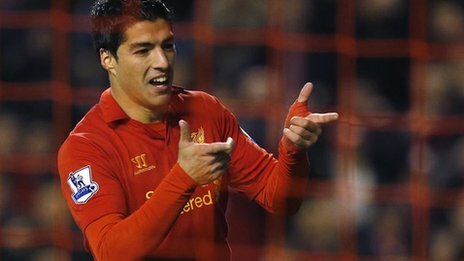 He is a world class striker,” Rodgers told Sky. There’s no doubting Saurez’s importance to a Liverpool side bereft of strikers but does he really merit the comparison with Messi? More on this, including Rodgers interview here. This entry was posted in News, Premier League and tagged football latest, liverpool, premier league, suarez on November 5, 2012 by soccerjerseyplus.